On demand of our customers find below a chart of cleaning recommandations. Please keep children away from all cleaning products. A. Medium-soft brush, warm soapy water / Rinse / Dry. C. One (1) tablespoon ammonia, one fourth (¼) cup hydrogen peroxide, three-fourths (¾) cup of water Rinse / Dry. Note: All cleaning methods must be followed by a thorough rinse with water. * Suntan Lotion, Tree Pollen, Wet Leaves and some other products contain dyes that stain permanently. 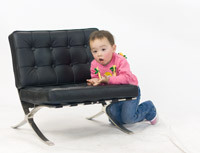 Picture: Toddler on VITO, black leather.